Game review: One Bird, One Thousand Bees, One Awesome Adventure! One Bird, One Thousand Bees, One Awesome Adventure! Hello and welcome to the first review by me, Nellac. Today I’ll be reviewing ‘The Birds and The Bees’ by Sceptile. Sceptile had been on Sploder from the very beginning, back from 07 and would still be on, if he didn’t receive a ban. He was a member who was very confident with his games, yet didn’t communicate with others to tell them about his upcoming games, usually he would just post a comment on his page saying that he’s working on a game; he didn’t give any real information away and I think I know why, Sceptile has this thing called ‘Asperger Syndrome’ and I know what it’s like, as a friend of mine has it. I feel really bad for him because in real life, he lacks in popularity, he told me this via the forums, just after his banning; but look what happened, he has over 5,000 friends, which is a really good achievement for someone of his condition. If you had the chance to get to know Sceptile, before his banning; you would know that he was quite a nice guy and surprisingly received over 400,000 views just because the PPG creator was made. To elaborate further, let’s start the review and see if ‘The Birds and The Bees’ really was feature worthy. Shall we? Wow, to me the game play is astonishment. It is very peaceful and the atmosphere is simply quiet. The Birds and The Bees is very straight forward, it’s simple, it isn’t unique and I find this common amongst PPGs. Although it doesn’t fail me, it doesn’t stand out to me against other PPGs; yet I still find it addictive, throughout the first four levels. I simply see that Sceptile has nicely arranged everything to do with the scenery, allowing us to enjoy and understand the well developed game play. If you’ve experienced most people’s games, they don’t show and represent as much peacefulness, if any. But then again, The Birds and The Bees is supposed to be almost full of melancholy and despondency as the story is based on such a mood. The scenery in The Birds and The Bees extraordinary, truly brilliant. Lots of brilliant graphics were used in the game and I think that Sceptile has done himself proud. Everything used in the scenery was well organised and I’ve never seen so many great graphics used in one PPG. The scenery suits the story quite nicely, so there’s not much to worry about. Sceptile even created the enemies in The Birds and The Bees, all in different shapes and sizes which I think is very common in recommended video games, such as; Super Mario Bros and Sonic the Hedgehog. Although the scenery lacked a bit in level one, I still found it advanced compared to other PPGs. A little, blue and white bird from a children’s programme called ‘The Regular Show’ is the main character of The Birds and The Bees, and they’re brilliant and unique graphics, made by the brilliant and unique Sceptile. The game was full of originality, on every level. Although the main character was copied from a children’s programme, it was still original on Sploder. I find that originality can make a good and huge impact on games and I find it very tolerable. With most popular PPGs nowadays, originality become widely used at the beginning of a game, but seems to fade or disappear on the following levels which is just plain rubbish. I’ve experienced a lot of originality in the game and I found it very common as I progressed playing The Birds and The Bees. This has been a great and major improvement since most of his other games failed in being original. It would surely be original in levels of the game, if Sceptile made it more constructive. It started getting a bit boring after level 4 but I’m still impressed with the outcome of the first 3 levels. But then again, originality isn’t everything, it just makes a game more addictive and something you would call rare. Sceptile’s games turned out to become rare in the past few months, so I guess I don’t want to depress his fans to much with the review. If Sceptile was still on Sploder, he should listen to this bit; I think there wasn’t enough brilliance and superiority with the placement. The Birds and The Bees had a couple of various that weren’t the best in my opinion. The main enemies were obviously the bees; and I’ve realised that Sceptile has just placed them facing horizontal, vertical and/or diagonal. The bees were mostly placed in precious paths; the bees were placed in narrow places, in other words. That’s one thing Sceptile needs to improve on but one thing’s for sure: it affects the difficulty. Since it affects the difficulty, it can become frustrating and I find this very common in all the levels of The Birds and The Bees. But I’ve noticed there is some excellence to the vertical position of the bee(s). Furthermore, the switchers were placed in great places or positions, but it still didn’t stand out to me; that’s the dilemma. Although I’d love to see this be improve. If the switches in The Birds and The Bees weren’t as confusing, that would most likely affect the addictiveness of the game. At least it’s a PPG so there’s no need to worry much about the placement for now; just a couple of things that Sceptile could’ve improved on. Now that’s finished it’s time for the ratings. The story didn’t match the mood of the actual game, which is a shame, but other than that the game play was well-developed. Almost everything was perfect but level 1 had a loss of scenery unfortunately, but I still found it pleasurable. It was very original but it got quite boring on the levels beyond level 4, as the originality dropped quite a bit. The placement needs to be improved as much as possible, the bees were placed in very narrow path ways or passage ways, but that isn’t the only thing. The switches caught my eye and I found it quite pleasurable. Overall it was a well made game and is quite addicting, although I feel it would’ve been better if everything was a bit better. 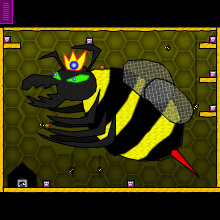 If the same amount of originality lasted all the way through the game it would’ve been a lot better, for example: there could’ve been a different type of bee, or a few more puzzles etc. Other than that, The Birds and The Bees was a brilliant game, well done Sceptile! Yes, no doubt about it. It deserved its feature. It was by far, one of the best, yet basic PPGs ever made. Thank you for reading, I hope you liked it.